Welcome to Show and Tell Friday! A couple weeks ago one of my coworkers brought me this beautiful English teacup that she no longer wanted. She thought it looked like something I would like and she was right! Then this week she came in with 10 beautiful dessert bowls for me...lucky me!! Thank you Jill, I really love them! As you can probably tell, I have a thing for pink roses! Love those dishes!! The photo with all the pretty dishes in the background is so inviting also! You are lucky to have a friend who passes such pretty things on. Everyone I know has the same style as me, so other than my grandmother, they tend to hang on to their treasures. You do indeed have a good friend who is willing to share. All your new things are lovely. Lucky you! How neat that she brings you these things. She clearly knows what you like. so romantic looking. i just love them. Beautiful dishes! I have a few of my Mother in laws, and cherish them! 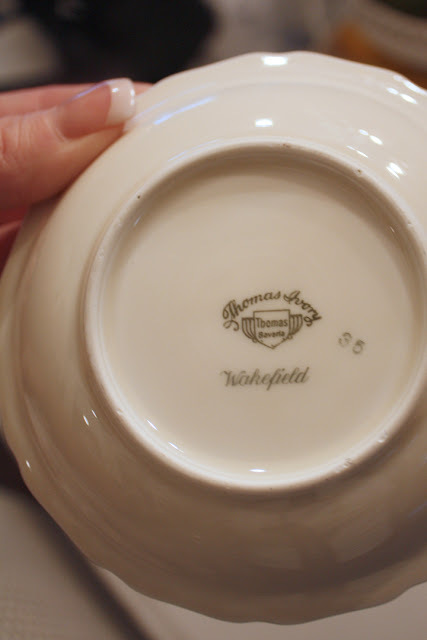 Love those little bowls -- they are so pretty! Ciny that was so sweet of her. She knows you very well. They are delicate and lovely. Thank you very much for hosting each week. You have a wonderful link party that I do enjoy. What a great co-worker-pretty gifts! Thanks Cindy for hosting! Gorgeous dishes, and lovely photos as always..they look so soft and pretty, just like the china. What a nice friend, she knows she is blessed to have you too. The dishes are very pretty. 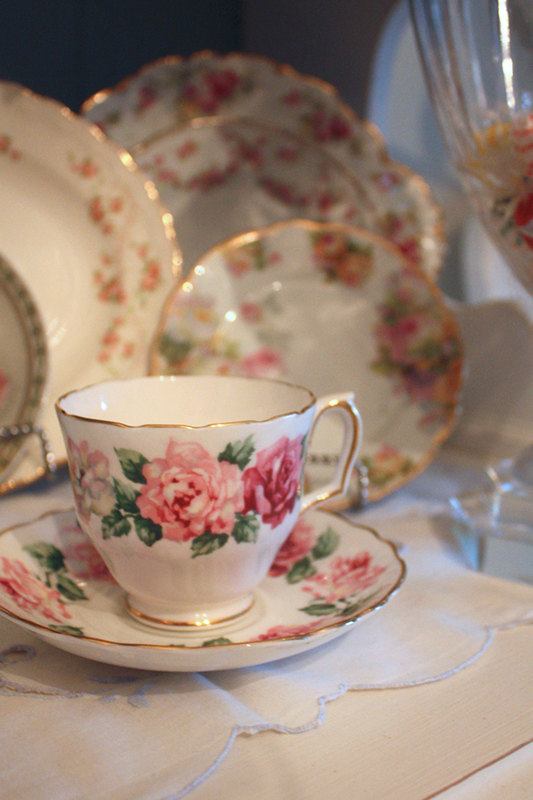 I love the teacup and saucer, I believe it is called Trinity Rose, I have the set and love them. They are really beautiful. 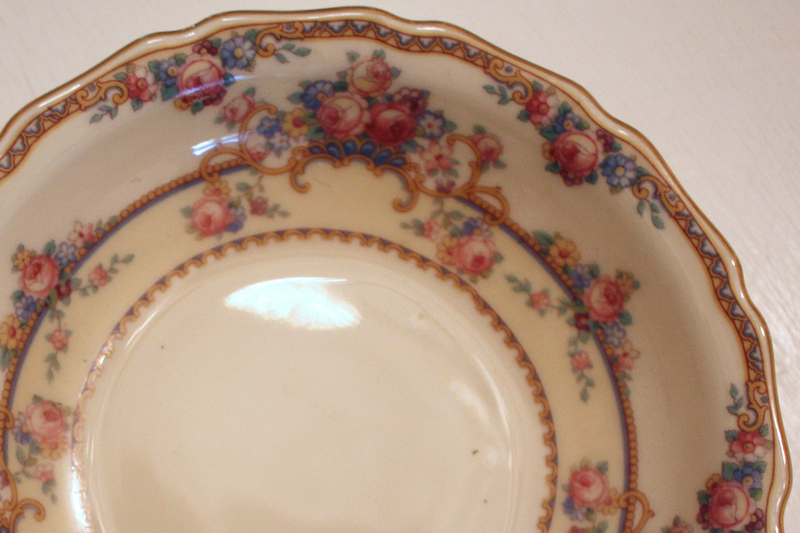 I like the Bavarian china as much as the Limoges. I usually find more of it too. Cindy, What a great friend! The dishes are lovely. 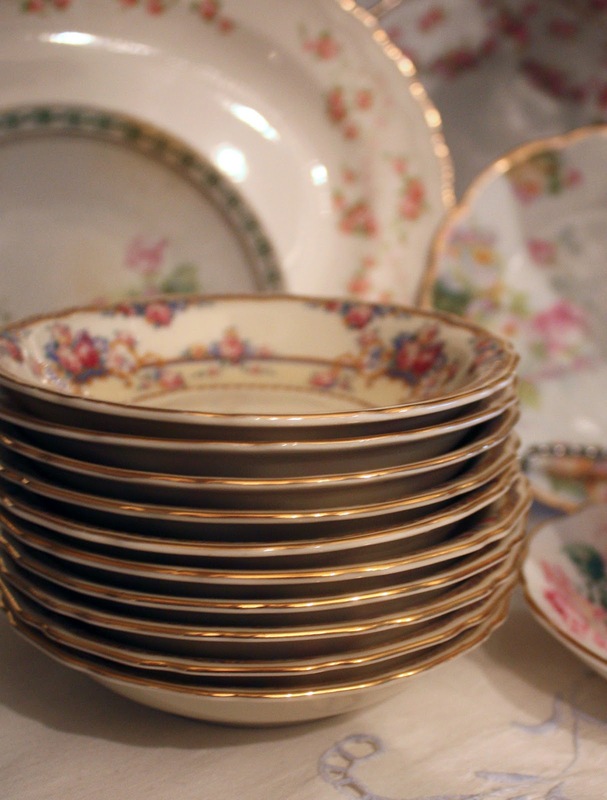 very pretty dishes! thanks for hosting this blog party. 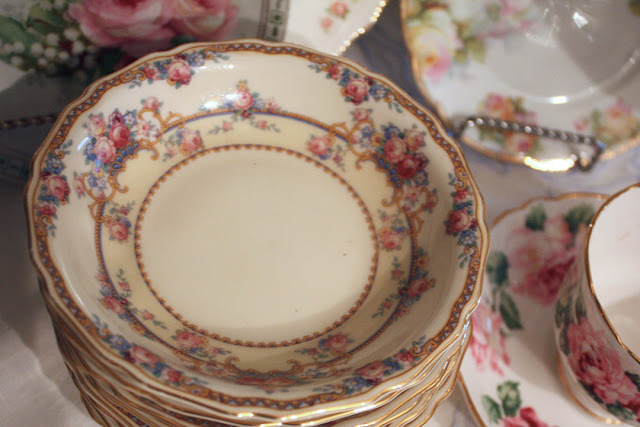 Your china is so lovely and delicate. Thank you so much for hosting such a wonderful link party each week. I enjoy visiting so many great homes/blogs this way. It's so "The Secret" isn't it? You put out in the universe how much you love roses and now they're just showing up left and right! What a great friend!Pink roses are my favorite too. I'm not sure if even any of my friends have flowered dishes. Their tastes seem to be more modern. Those dessert bowl are great! I love the pattern and colors! What a great friend you have, Cindy! It's so nice to be blessed in unexpected ways. I have the same teacup you featured in the first photo ... love the roses and the beautiful colors. Thanks for sharing and for hosting this fun party. Dear Cindy: What a sweet friend you have! I love the way the blue is highlighted with the pink roses on the dessert bowls. Just stunning. Thanks for hosting this gorgeous party every week! Such sweet dishes and teacup!! What a nice friend to give such a thoughtful gift. 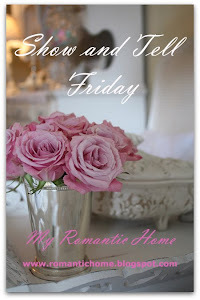 What pretty items, and what a thoughtful friend!! 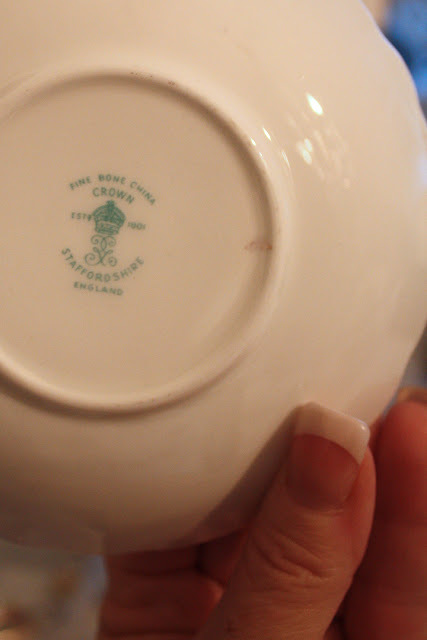 I was born in Staffordshire, so was pleased to see the underside of that gorgeous cup and saucer. Happy weekend to you!! Beautiful little dessert dishes and cup and saucer -- your colleague knows you well. As always, beautiful presentation and picture-taking. I just came across your blog, and your insights into home improvement, DIY projects, and overall design are very interesting. Your article about show and tell Friday was especially interesting. I really liked your comments on the pink rose plates, they go so well with a vintage decor in, say, a dining room or kitchen. I am adding you to my favorites. Since you and your readers have a flair for interior decorating and interest in design, we thought you would especially be interested in our custom window coverings. Heritage Window Coverings is located in Huntington Beach, CA and we have a wide selection of treatments to complement any home’s interior design! Any feedback would be appreciated as well. 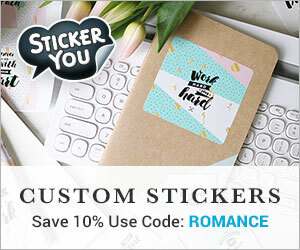 As a special thanks to you and your readers, I would like to offer a 20% off coupon using this code upon checkout: BLG20. You lucked out big time with those wonderful dishes. What great gift! Are they displayed in your hutch? I love pink roses, too. Those pieces are beautiful. 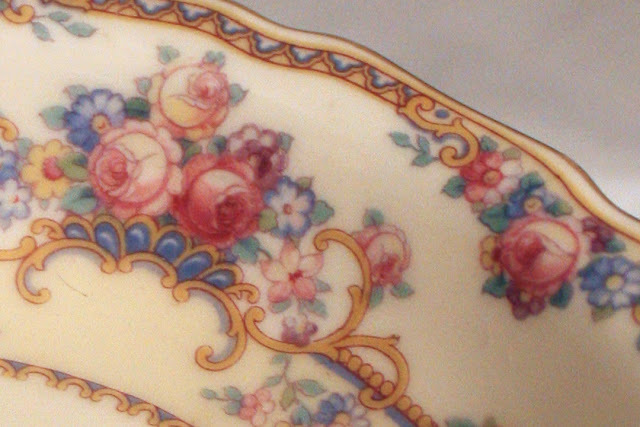 The roses remind me of the ones on my wedding china. You are lucky to have such a generous coworker. Thank you SO much for hosting all the fun inspiration ! Cindy, I really love the cup and the dishes too! 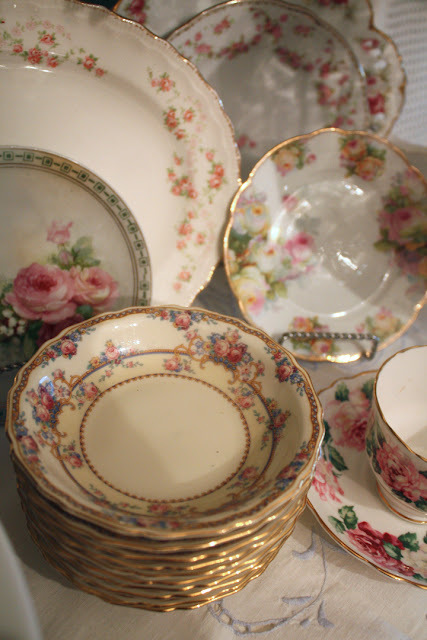 they are so beautiful especially when you arranged them with other pretty pink roses dishes! awesome! thanks for sharing and have a great weekend! Beautiful dishes! I also wanted to say thanks for being one of my top referrers for 2010. You rock! Beautiful-especially the ones from Bavaria. My husband grew up there so his family has lots of similar dishes. They are my favorite!